I'm betting you have an artifact in your wallet or purse. We know it fondly as cash. And nostalgically, for we are in the final decades of the ancient innovation of coinage. Plastic and electricity have replaced precious metals as the underpinnings of finance. We no longer need to await the arrival of the gold fleet to start the next war. Cash, of course, used to be king, but ships were never a cash crop. Unlike agricultural or mill goods that were readily redeemable for legal tender, ships were a more complicated venture that only returned investment after considerable delay. 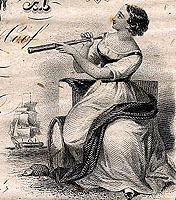 Investors in Bath-built vessels, whether the local tradesman or widow with their 1/64th share, or the retired captain or banker with his 1/8th share, had to watch their money simply sail down the river out to sea, and hope for the best. They were used to this. Once over the horizon, the ship became a financial abstraction more akin to a modern mutual fund than the graceful, redolent, lofty shape that slid into the river at the end of the street. And just as capable of sinking. Maybe next year, word would filter the long way back via harbor agents, shipping news, or telegraph, of a successful turn around in Sidney, or of burning to the waterline beyond Valparaiso. Typhoons in the Sea of Japan provoked greater worry on Bath sidewalks than any summer hail on the corn in Sagadahoc County. And acts of God were the least of it to maritime speculators, who were entirely in the hands of their ship's captain and his ability to stay sober, commandeer a functioning crew, and to make perceptive business decisions in foreign environments without council after the harrowing dangers and excruciating boredom of overseas voyages. 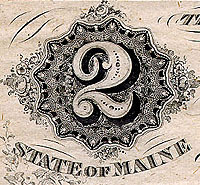 Let us look below at some monetary artifacts that were passed over bank counters, kept in the pockets of, or otherwise facilitated the risk-prone, financial world of maritime Maine. Unlike most objects in our collection, money is often conveniently dated. 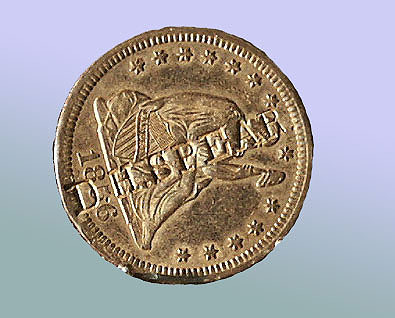 This 1856 American quarter dollar has been stamped, "D. H. Spear," transforming it beyond merely legal tender into a token kept by succeeding family generations. D. Howard Spear had some luck. Son to a shipyard blacksmith, Spear continued in the trade, ultimately partnering in the successful Bath shipyard Kelley, Spear Company. Born in 1849, he was 7 when the coin was minted. Was it a presentation piece from his father, or a schoolyard fad to stamp your name in a new quarter? Naturally, grown men would never resort to such things... Spear died in 1911 at 62 when the firm was still prosperous, and all shares were still held by the partnering families. 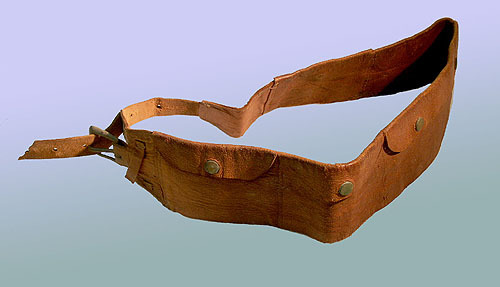 This money belt is known to have been used by second mate Everett Johnson Burtt, the donor's grandfather, aboard the bark William P. Frye in 1901-1902, from New York to Shanghai to San Francisco. He also sailed aboard the bark Edward Sewall from Bath to San Francisco, Liverpool, and New York, in 1900-1901. The belt's soft leather and slim profile would have helped its concealment in the on-board life, where cash was kept close to one's person. Upon the smallest of coins, smaller than a dime, two naval empires pivoted. 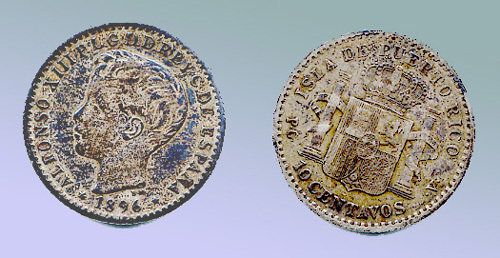 When it was minted in 1896, this silver 10 centavos piece from the Isla de Puerto Rico, was a legacy of the vast Spanish colonial empire that had its beginnings 400 years before. Within two years it was a worthless novelty, a souvenir of the 1898 Spanish-American War. 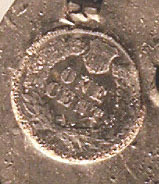 Found in a letter from a house in Bowdoinham, Maine, the coin was taken as a memento by the American prize crew placed aboard the Spanish merchant steamer Buenaventura, taken off Key West by the American fleet as it steamed south to blockade Cuba. Though the Maine was destroyed in February of 1898, it was not until April that the Buenaventura was hailed as the "first prize of this war". As part of the same war, Admiral Dewey's naval actions in Manila Bay forced Spain to cede the Philippines to a newer United States hegemony. A new empire prints new money. top: a 1922 five peso note with the Admiral on the right and his president, McKinley. The word "Victory" is repeated on both sides of this note. 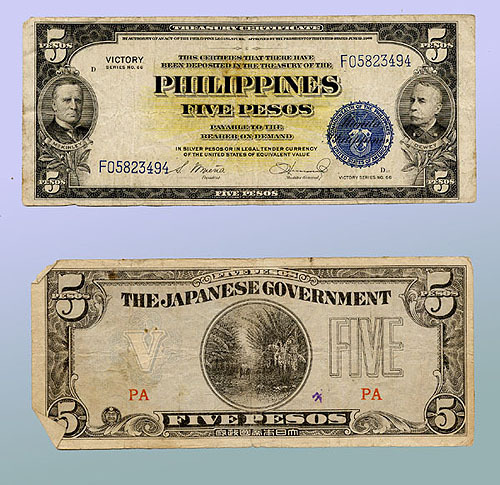 bottom: By 1941, with the hostile occupation of the islands, the bill shows a peculiar blend of three empires: a Spanish note in American format and language, printed by the Japanese treasury. Japanese characters are just visible at the lower center edge of the bill. The "V" for "Victory" was carried over as well; the word is popular with occupiers. 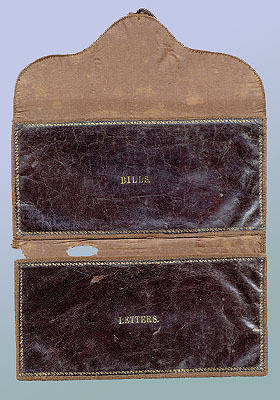 The silk lined, gold embossed wallet of Capt. 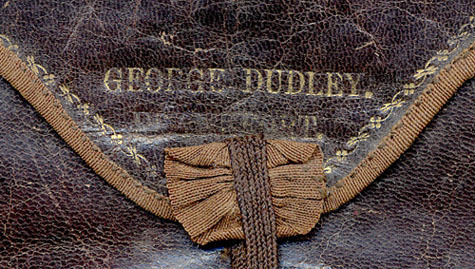 George Dudley of Winterport, Maine. 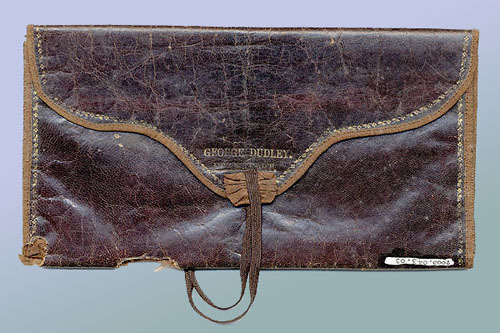 Dudley's desk, his octant, and his logbook from an 1854 passage from Liverpool to Calcutta place him squarely in the first half of the 19th century. Where in his lifetime did this gentleman's fine accessory join him? It is well worn, but would it have survived much time at sea? It was not really of use underway, but may have been unpacked with a frock coat to go ashore. You owe your sole to the company store. Your sardine, actually, at least in Stonington between the wars. 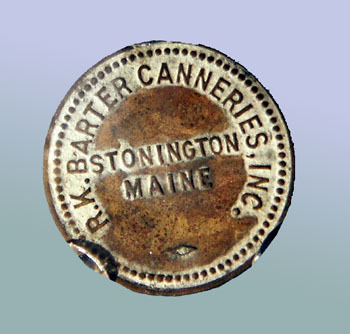 This company-issued token wouldn't buy a drink inBangor, but was good for groceries in cannery towns where the work force stayed close to home. This kind of payment kept you close. This 'pork chop' of lead is part of a series of weights that sank a tub trawl fishing line down to the right depth for the big cod. 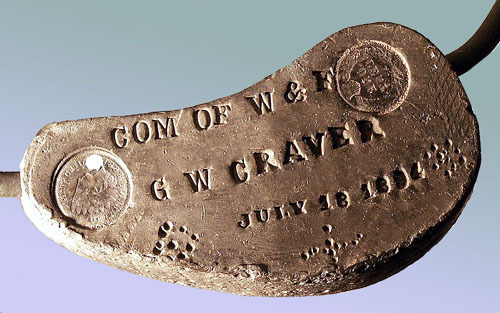 On July 18, 1894, one G. W. Craver had some time on his hands, and got inspired to punch an impression in the soft lead using an 1888 Indian-head penny. I have digitally reversed the details below to make the lettering readable. 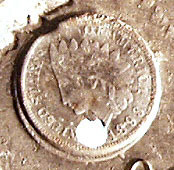 The Indian-head was minted for the fifty years between 1859 and 1909. Craver must have really slammed it; except for the drop of white paint, the impressions are very distinct. From the days when we still stooped to pick up a penny, this most humble of savings banks is also embossed with an Indian-head, which likely dates it before 1909. It is hardly more than a pill box with a slot, readily twists open, and might hold 20 cents in the pocket of a child un-tempted by penny candy. 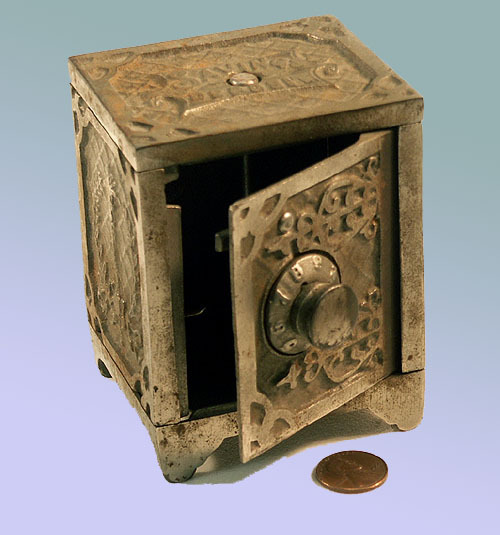 For the saver with a bigger allowance, a cast iron miniature of a bank safe, complete with rotating, fully functional combination dial. On the back side is a coin slot. Noting the penny for scale, there is not much keeping big brother or sister from swooping in and making off with it, even when locked. For the more sophisticated saver, this hockey-puck-sized dime bank, ca. 1950, extols the virtues and rewards of habitual daily thrift. 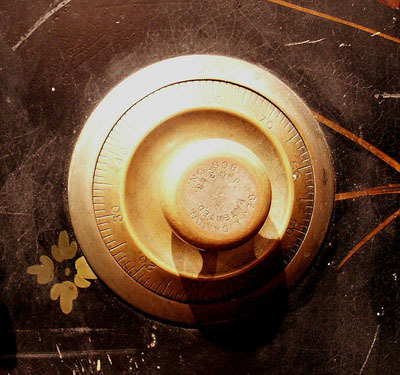 Numbers and lines on the outer rim imitate the tumbler dial on a combination safe like that below. 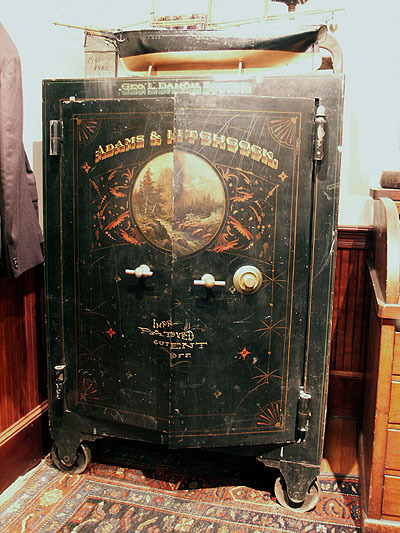 Despite its cast iron wheels, this Damon safe was not lightly installed in our current shipyard office gallery. It has been customized with elaborate artwork and the Adams & Hitchcock name, a Bath shipbuilding and brokerage firm from the 1870's. There is more artwork on the inner doors and carpeting on the inner floor. 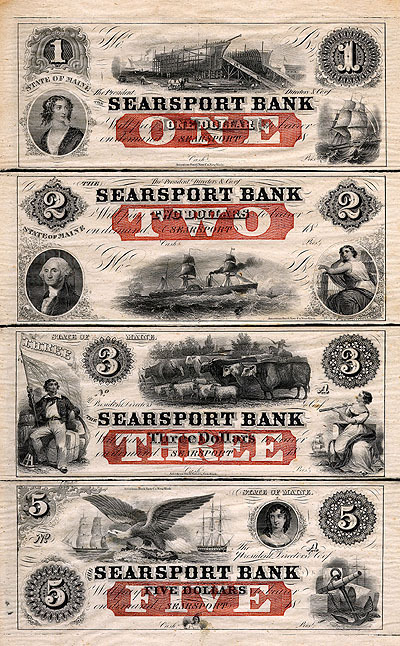 A beautifully engraved creation of the American Bank Note Co. of New York, this uncut sheet of specie drawn on the Searsport Bank projects the bank's robust vision of 1850's maritime Maine, with its surging steamships, fattened livestock, and crowded shipyards. While a familiar portrait of George Washington can be seen on the Searsport 'two', it would be interesting to know if the women depicted in the other oval frames are also historical individuals, however stylized. The detail of the shipyard has been carefully rendered, from the scaffolding down to the pitch pot smoking at left. By 1857 a recession had tempered expectations, idled many yards, and financial uncertainties of the imminent war over secession were looming. 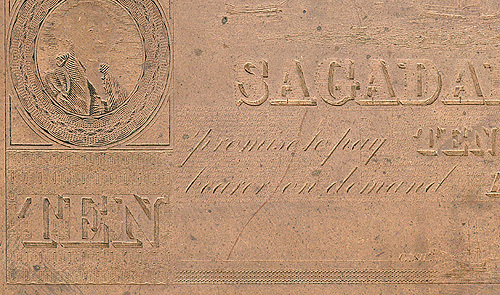 A 9"x13" copper printing plate with impressions of four notes drawn on the Sagadahoc Bank of Bath, with a digitally reversed detail (below). The engraved, flowing, but formal lettering seen here was taught in schools as copperplate penmanship; 'Copperplate' is found today in computer font menus, though its look is different. 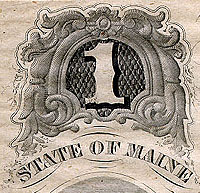 There are phantom markings from earlier editions; the plates could be burnished smooth and re-used. By the chink of coin or the quiet ruffle of bills, there is revealed a satisfying presence to the handling of 'real' money, once much more common in past days. Much of the financial activity of Bath involved pushing coins, notes, and accompanying receipts back and forth through cashier's windows like this one. It is one part of a large section of the tellers' counter saved from the ca. 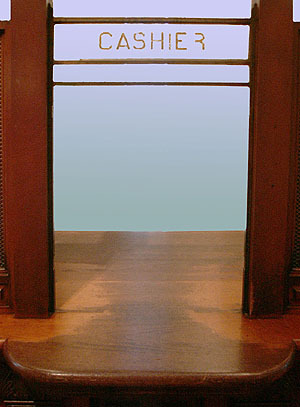 1900 lobby of the Marine National Bank of Bath. 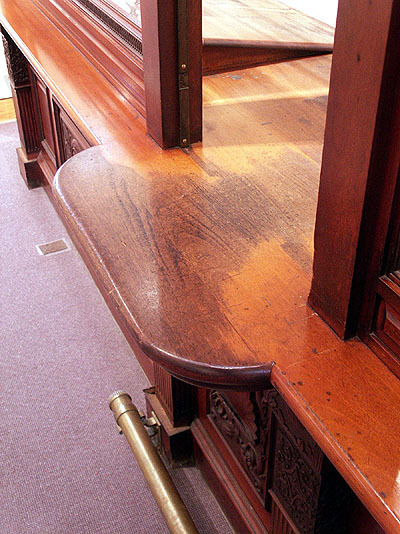 The amber gleam of the shellacked mahogany fades into the equally lustrous patina left by generations of banking transactions. 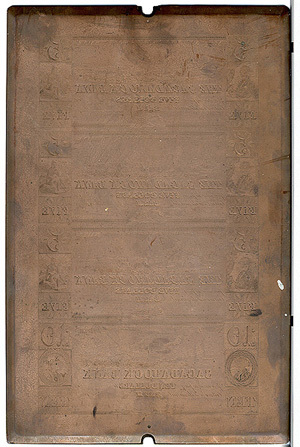 Note the brass footrail, to afford relief as one's deposits or withdrawals were tallied up in hand-entered ledgers. 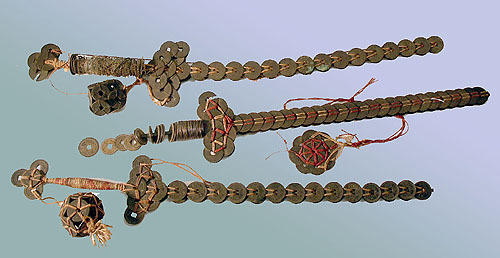 These 'swords' are actually assemblies of bronze or brass Chinese coins bound together in careful arrangement. 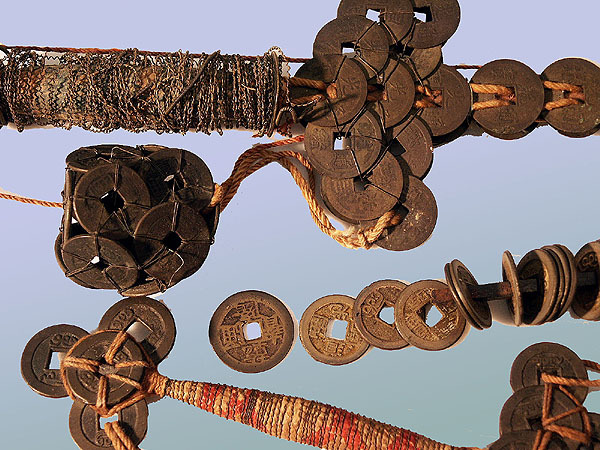 The coins, particularly those from certain long lived dynasties, the red or yellow binding thread, and the sword shape are all considered to be of great positive power in the Chinese spiritual outlook. Three different Mainecaptains returned from three different voyages with these appealing souvenirs, though they look like they were made in the same shop. Here is George again, looking more familiar, except for the small yellow sticker that reads, "Save Our Shipyard for the Future". In the center of the label is the waterline silhouette of a nuclear submarine. 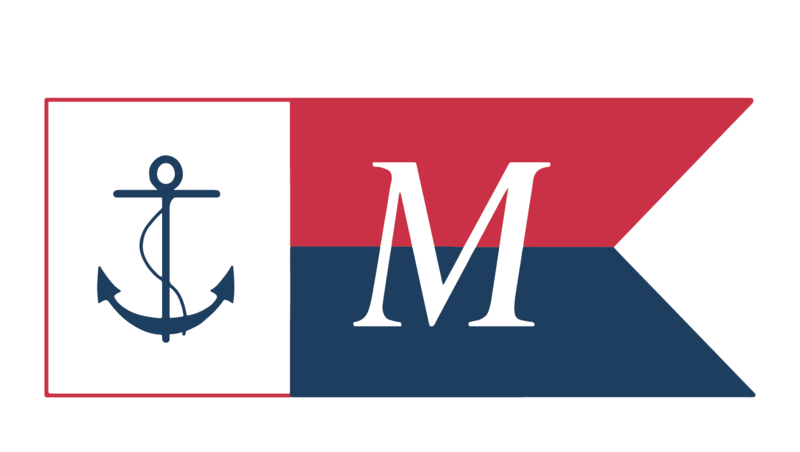 In 1993, the Portsmouth-Kittery Naval Shipyard was being considered for closure by the Pentagon; during the hearings, concerned employees distributed the stickers affixed to dollar bills to draw attention to their cause. This idea is not a new one, but is always an effective promotion. Successful in 1993, this Maine naval base also survived the 2006 base-closure round.